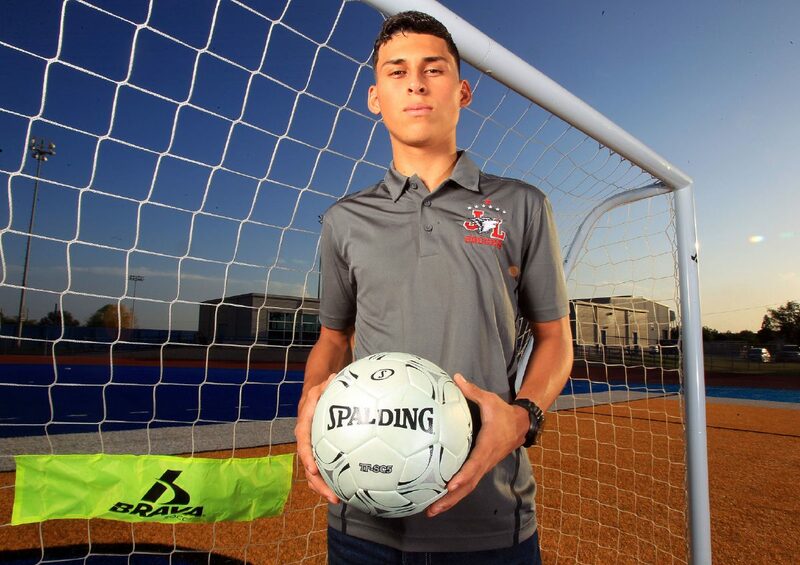 La Joya Lincoln-Juarez 's Leo Pruneda, Defensive Player of the Year poses at Valley View High school on Thursday, June 7, 2018, in Pharr. On a team chock-full of offensive threats, La Joya Juarez-Lincoln coach Victor Ramos knows the importance of a shutdown defenseman. While his forwards and midfielders often put their mark on the game with goals and assists, he says defender Leo Pruneda was the Huskies’ best player last season. At 6-foot-3-inches, Pruneda towers over most of the players he marks. But what he does with his height advantage makes him special. His size, skill and clinical responsibility helped Pruneda become The Monitor’s Defensive Player of the Year. In the last two seasons, Juarez-Lincoln went 23-3 in District 30-6A play, winning championships both years. The Huskies advanced to the state semifinals in 2017 and earned a trip to the regional semis in 2018. During his senior season, Pruneda was an anchor for the squad. When the Huskies were on offense, he typically situated himself at midfield and did his part to make sure the ball remained in the opponent’s half. Even as the team’s top defender, being the tallest player on the pitch also meant he was called on for headers on target. On corner kicks and free kicks, he was a threat to put the ball in the net. He tallied 15 goals in 2018, either converting headers or launching powerful shots from long range. The defender said his decision-making wasn’t too complex and downplayed the work he did on the pitch. Even after hearing that his coach had called him the best player on the team, and maybe the most difficult to replace next season, Pruneda just smiled and maintained that he was simply a conduit to Castrejon and Reyes on offense. “No, really. That’s all I would do,” he said, laughing.